My daughter’s house flooded in the “Great Flood of 2016”. When the trucks came to her house and lifted the pile of household debris there were some objects and fragments of things left on the ground. 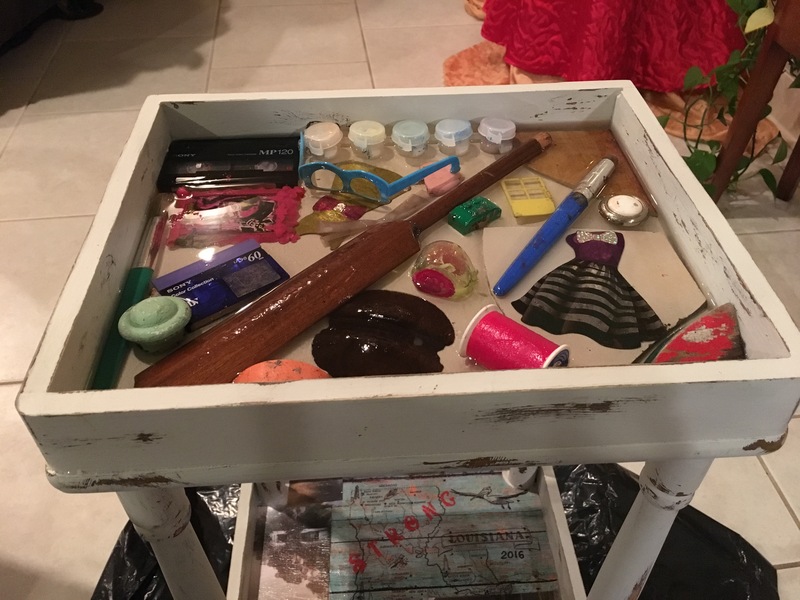 She saved these items in a bag and told me she wanted some kind of memory table or box made to put these items in. This year for Christmas I was able to make this project for her. These fragments hold memories and she can now have a safe way to keep and display them. I found the end table at a Thrift store in New Orleans. It did have an edge on part of the top shelf but my husband took that off and made sides around the top and bottom shelf. I thought maybe she had enough objects to fill in both shelves but they ended up all fitting on the top shelf. 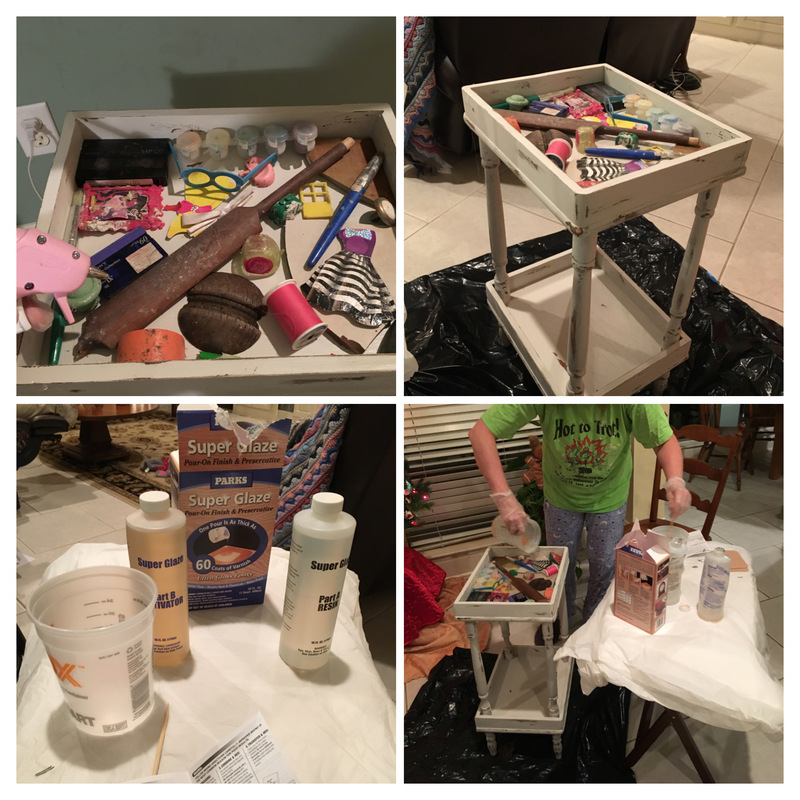 My 1st step was to stain the new wood that he added to it so that when I distressed it a pretty wood color would show through. Then I painted it Pewter Gray and distressed it. The next step was to do something special with the bottom shelf. I decided to decoupage pictures of her house during the flood, her debris pile and a Louisiana map. 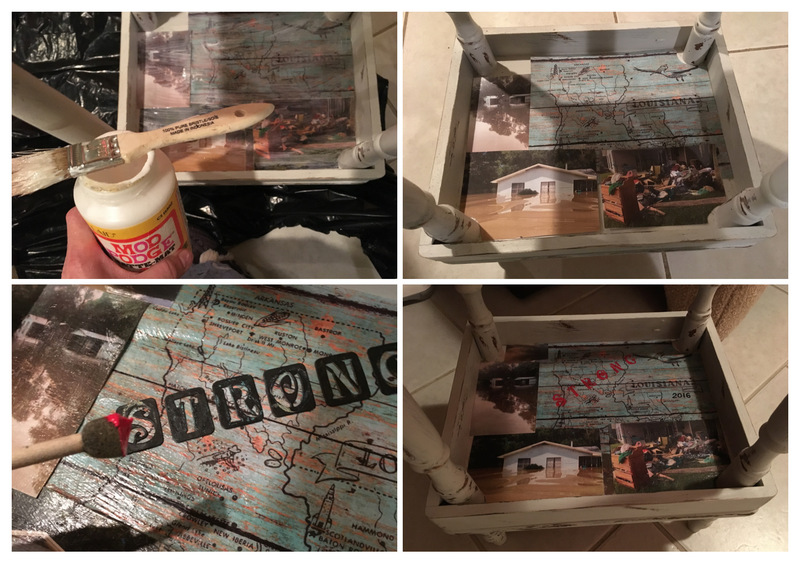 I stenciled the word STRONG across the map to show that we are Louisiana Strong. 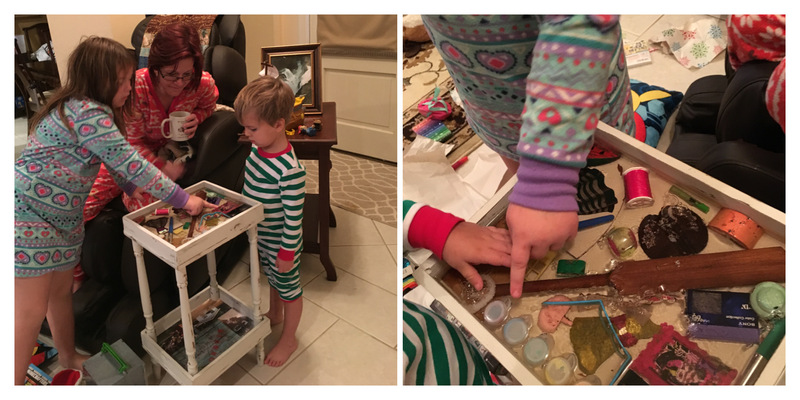 On Christmas Day I surprised her and the grandkids with the table. It was very emotional for her as her and the kids started pointing to the objects and naming them. A lego, a paint set, paintbrushes, Mr. Potato Head glasses and a ear, a spool of thread, a piece of the tile floor, knobs from furniture, a spindle from a chair, video tapes of her 1st child’s birth are just a few of the things in the collage. One day she will be able to look back and see how some good things did come from this experience and she can still hold on to some of the memories from before the flood.